So last time we discussed what sort of tools you need to have for a basic home jewelry repair kit – a couple of pairs of pliers, and a pair of cutters. But what exactly is a cutter? There are a virtually unending variety of styles of cutters, but they generally fall into two categories – side cutters and end cutters. Other than that the main differences between the types of cutters is their size, and the type of cut that they make. Both of these types of cutters work essentially the same way – the jaws pinch together and pinch the wire until it breaks. Now the key word here is “pinch”. This graphic shows the basic process of how a cutter works and its effect on the wire. If you look carefully you can see that the jaws on the normal cutters create points on both pieces of the wire. This pinched point must be removed with a file because it is sharp. The second picture shows what happens when you have a double flush cutter. The jaws of the cutter actually bypass each other, like scissors, and the result is a much less sharp point on the wire. You can’t actually see the shape of the wire because it is blocked by the jaws themselves in the picture. 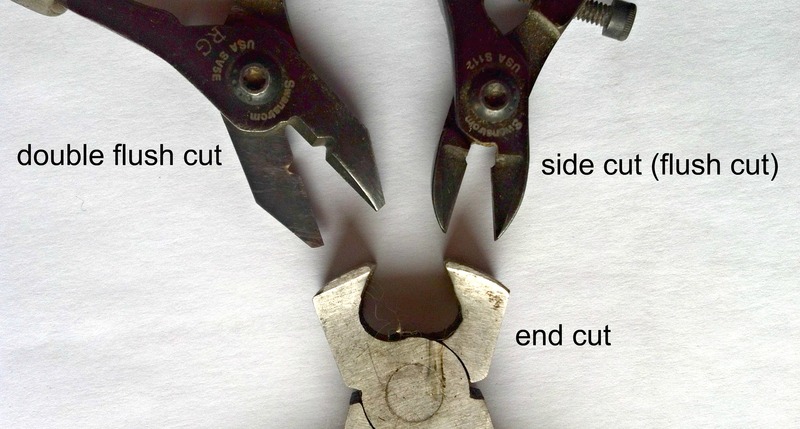 If you look back at the picture of the double-flush cut pliers, you can see that there are actually special notches in the jaws that limit the amount of “pinching” that occurs to the wire. You may still need to touch it up with a file, but the “fix” is much quicker. So, if I had to purchase just one pair of cutters what would I buy? A side cutter, and more specifically a double-flush side cutter. Why? A side cutter is very easy to use. It can get in very close to whatever you are working on. It generally has very sharp jaws, which cut easily. You hold them in your hand the same way that you do a pair of scissors, so most people find them easy to use. They are readily available at most supply stores (including hardware and hobby stores). The double flush cut part of the name is easy – I am lazy! I like not having to do a lot of filing on every single piece of wire that I cut! At this point I should mention one other VERY important point. Tools have limitations. Cutters are designed to cut only certain sizes and types of wires. The average hobby jeweler only uses thin wire (generally 26 to 18 gauge) and the average pair of cutters will be absolutely fine for that. But if you want to be able to cut big beefy wire, like 10 or 12 gauge, you are going to have to buy sturdier cutters. Most of the wire that is used in jewelry is relatively soft, but if you want to use iron or steel you are also going to have to buy sturdier pliers. Steel will chip the blades of many pliers. Read the information that comes with the tool before you buy. Damaged tools are no fun! I hope that this brief blog gives you some insight into the type of cutter that you need for your tool kit.